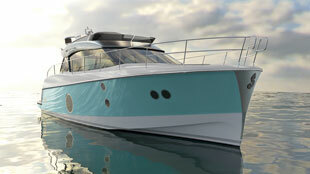 Beneteau has released details of a new sub-60ft flybridge range, dubbed Monte Carlo. 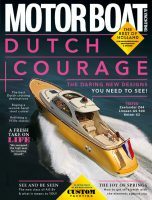 The first boat will be the 50ft Monte Carlo 5, to be launched at the 2013 Dusseldorf Boat Show. The new line-up is distinct from the Beneteau Group’s top-of-the-range Monte Carlo Yachts boats, but the company has used the same designers – Nuvolari & Lenard – for both ranges, so the family resemblance is strong. “We wanted to send out an instantly understandable signal,” said Carla Demaria, general manager of Beneteau and president of Monte Carlo Yachts. The Monte Carlo 5 will come with Volvo IPS power – either IPS 500 or IPS 600 – with the larger engines pushing it to 30 knots. Down below, owners will take the mid cabin, which will enjoy plenty of light from those distinctive rounded ports, while guests will sleep in the VIP forward. A further bunk cabin on the starboard side and a crew cabin behind the engines complete the accommodation.